There’s nothing like watching someone else cook to inspire you to make something new. Here are links to some fun whole grain videos that just may send you running to the kitchen to try your own hand at some delicious new ideas. 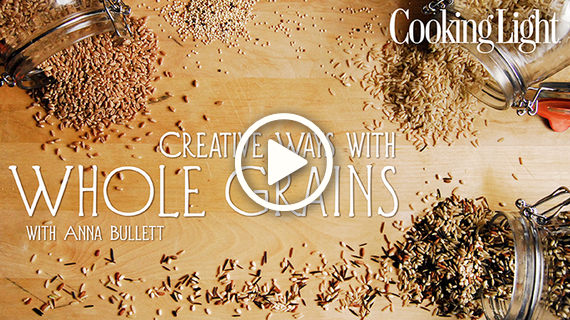 Also, be sure to check out Creative Ways with Whole Grains, a free online mini-class (about an hour of videos) from Cooking Light’s executive chef, Anna Bullet. The class, which teaches about how to cook with diﬀerent whole grains, includes 14 of Cooking Light’s most popular recipes! Maria Collins uses equal amounts of white whole wheat ﬂour, oat ﬂour and ground nuts to create her ﬂuﬀy waﬄes. Using skim milk and eggs, she packs them with healthy protein and dietary ﬁber to give you great energy to start your day. Topped with maple syrup, nuts and/or fresh fruit is eating well at its best. Who can resist having chocolate for breakfast? More than half of the grains are whole grains in this yummy chocolate chip muﬃn recipe from Stephanie Gallagher, the “Iron Chef Mom.” In addition to replacing much of the all-purpose ﬂour with whole wheat pastry ﬂour, Stephanie adds bran to give these muﬃns a boost of ﬁber and ﬂavor. All of the ingredients and measurements are clearly listed at the beginning of the video, making this recipe a cinch to recreate at home. WGC culinary advisor Ellie Krieger makes an easy dish for Sunday brunch. We love that she doesn’t make a big deal about using whole grain bread – she just does it ‘cause it’s the normal thing to do. Best if you put it together at least two hours before you bake it for 40 minutes at 350°F – making it up the night before, like Ellie does, is even better. We’re all trying to save money and eat fresher, more wholesome foods these days. Chef Keith Snow shows you how to create your own healthy pancake mix, with three diﬀerent whole grains. One extra tip for whole grain pancakes: If you separate the egg and beat the egg white ﬁrst, you’ll get ﬂuﬃer pancakes! Chef Keith Snow makes steel cut oats. While all kinds of oatmeal — instant, quick, regular, and steel-cut — are whole grains, steel cut oats have texture and nuttiness that appeals to many people who may not previously realized they love oatmeal. The downside? Cooking steel-cut oats can take 20 to 30 minutes. But you can short cut the process simply by soaking your grains overnight (see additional video). Pamela Dockery of TwoStews.com shows us how to make our own granola. Another great recipe to try with the kids on the weekend. They’ll enjoy it for breakfast, or just by the handful as a healthy snack. We also enjoy homemade granola with a good farm yogurt and some fruit, in a parfait glass. Ellie Krieger’s recipe for blueberry pancakes uses buckwheat ﬂour and whole wheat pastry ﬂour, for double whole grain goodness. Save some of the blueberries as a garnish. We sometimes like to cook the extra blueberries until they burst, and mix them with a small amount of maple syrup. Then, when you drench your pancakes in “syrup” you’re getting mostly blueberry juice, and just enough syrup to add that wonderful maple ﬂavor. Ellie Krieger’s making a special weekend treat: Blueberry Coﬀee Cake. Enjoy a small piece with scrambled eggs or a vegetable omelet for breakfast. If you use whole wheat pastry ﬂour for all the ﬂour, then beat one or both of the egg whites to keep the cake light. Nutrition instructor Todd Seyfarth substitutes ground beef with bulgur wheat to creat a ﬂavor-packed, nutritional dinner option. When cooked similarly to taco meat with bold Southwestern seasonings, bulgur yields the look and similar texture to ground beef. Todd mounds the taco with avocado and salsa and demonstrates an easy low-fat sour cream and roasted red pepper topping. Jody Adams, chef/owner of Rialto resaurant in Cambridge, oﬀers her interpretation of the Northern Italian dish pizzocheri. Jody’s version oﬀers butternut squash, red bliss potatoes, aromatic nutmeg and sage, and Parmesan and fontina cheese. It’s a hearty whole grain pasta dish that’s ﬁnished in a skillet under the broiler for a crunchy top that’s warm, satisfying and family-friendly. One of the most popular recipes in our own Dozen Easy Family Whole Grain Recipes collection is our whole grain pita pizza. Here’s the video made by the Whole Grains Council to illustrate how it’s done. Chef John of Foodwishes.com says he uses brown rice in this dish speciﬁcally because it adds a “great nutty ﬂavor and texture” – not for nutritional reasons. Wherever the inspiration comes from, the end result sounds delicious. Chef and cookbook author Mike Chiarello makes a nice pasta dish with rich, deep ﬂavors. But please DO NOT use a mandoline without the safety guard, as Mike is doing here. It’s really, really dangerous (this is the sad voice of experience begging you). It’s traditional in Normandy and Brittany to use buckwheat for crêpes or “galettes” as the large, thin pancakes are often called in these areas. Believe Chef Tse when she advises letting crêpe batter rest for a while before cooking — you’ll get better results, especially with whole grains. (The resting helps the gluten develop so everything holds together when you ﬂip it, and when you roll or fold it around your ﬁlling.) You might also try using whole wheat pastry ﬂour in place of the unbleached ﬂour part once you get the hang of cooking the crêpes. Rather than warm the ﬁlling, you can ﬁll all your crêpes then put them in a slow oven to melt the cheese just before serving. Ellie Krieger from the Food Network uses a generous helping of mushrooms and extra lean ground beef to give this Bolognese sauce a delectable meaty ﬂavor. This vegetable rich sauce is tossed with whole wheat fettuccini, for a simple meal that would be perfect for weeknight dinners. Bulgur with Almonds and Cinnamon (4:16) Journalist and cookbook author Maria Speck shares one of her favorite nutritious and delicious dishes. Bulgur, a versatile grain, is enhanced with the ﬂavors and aromas of toasted almonds, cinnamon and cayenne pepper. Serve as an accompaniment to lamb or ﬁsh entrees or enjoy as a healthy snack. Whole wheat pasta has come of age, with new brands that are tender and tasty. In this video, Whole Grains Council culinary advisor Ellie Krieger uses it to make a cool summer salad. Love brown rice, but don’t have enough time to cook it at dinnertime? Mark Bittman, the NY Times “Minimalist” shows you a shortcut. When you think he’s done, keep listening for some great background information on brown rice. Bittman doesn’t get speciﬁc about amounts in this pilaf recipe, so we’ve added some typical amounts to give you a rough idea. But think about it: his anything-goes approach reminds us that (with the exception of baking) measuring really doesn’t matter that much in cooking. These delicious muﬃns are so moist and tender you won’t believe they’re healthy! Packed with carrots, apples, coconut, raisins, pecans and two diﬀerent whole grain ﬂours, Maria’s Morning Glory Muﬃns oﬀer all the ﬁber, protein, vitamins and minerals you need to start your day and keep you from craving that 10 a.m. snack. Maria Collins is a whiz at baking, but still appreciates the simplicity of a quick bread (no yeast required!). A blend of nutritious ﬂours serve as the base to this batter that is sweetened with pure maple syrup. Make it ahead for weekend brunch! Making whole wheat ﬂour tortillas from scratch is actually easier than you think! This video from Archana’s Kitchen lists all ingredients and amounts clearly at the beginning, and the steps are actually super simple! A touch of butter gives these ﬂour-dusted, ﬂame-ﬁnished tortillas the restaurant-quality taste we all crave. A great recipe to have in your back pocket, for pizza dough made with an equal mix of whole wheat and reﬁned wheat ﬂour! In this informative video from Susan’s Cooking School, the host carefully spells out the ingredients and explains her technique throughout each of the steps. The art of pizza making is demystiﬁed in this video from the Home Baking Association. Novice cooks will enjoy the tips and tricks shared from home baking expert Sharon Davis. Half of the ﬂour used is whole wheat, but this video doesn’t dwell on the health beneﬁts. Rather, it’s all about the great taste and winning techniques! One of our favorite whole grain videos. Breadtopia’s Eric Rusch takes us step by step through making an almost-no-knead boule that is modeled after Paris’ famous Poilâne loaf. Mark Bittman shows how you can make an easy ﬂatbread with just four ingredients. He doesn’t give details on the curried cauliﬂower, but who cares? The point is you can put some interesting ﬂavored veggies (doesn’t even have to be cauliﬂower) in the bread, to get an exotic south Asian ﬂavor. Another wonderful Breadtopia video, this time of a classic whole wheat recipe from the King Arthur Flour cookbook. This seems to be a Canadian recipe (measurements in metric, gas marks on the stove) but it’s so clear and simple we wanted to include it. This whole wheat bread rises overnight in your fridge. Baking bread is not just easy … it saves money, tastes good and will be a hit with your entire family. This versatile and simple recipe, using whole grain white wheat ﬂour, is your ticket to healthy and wholesome sandwiches, bread bowls, hamburger buns and more. This video, courtesy of the Kansas Wheat Commission, Home Baking Association and Wheat Foods Council, gives step-by-step instructions for perfect bread, every time! Denise Drower Swidey introduces an updated version of S’mores. Using dark chocolate which has less sugar and powerful antioxidants, ﬁber-rich whole wheat graham crackers and potassium powerhouse bananas, you can still assemble the chocoalte and marshmallow gooey goodness you love. Nice and warm right out of the oven or ready to assemble without baking, it’s a tasty treat for kids of any age. Home cook Jenny Jones presents an easy homemade brownie recipe that is ready in just 30 minutes. Whole wheat pastry ﬂour, plain Greek yogurt, and olive oil are some of the unexpected substitutions that Jenny uses to give this rich, chocolaty treat a healthy makeover, without sacriﬁcing taste. This recipe comes from the wonderful King Arthur Flour’s Whole Grain Baking cookbook and the bread experts at Breadtopia — two great resources for whole grain bakers. Hunt around the Breadtopia website and check out their whole grain sourdough, too. Want to cut the fat? Experiment with substituting 2 ounces of applesauce for half the butter. The best foods in life are simultaneously healthy and delicious. This Chocolate Mocha Cake from Ellie Krieger is a great choice for the next special occasion in your life. Eating healthy doesn’t mean you can’t ever enjoy dessert — just look for choices that include whole grains (and other good things). Ellie Krieger’s carrot cupcakes make sure that your dessert oﬀers more than empty calories, with a luscious carrot cake — and reasonable portion sizes due to the cupcake form. Another great project to do with the kids, on the weekend. We’re always looking for even more great whole grain videos to add to this page. Email Kelly if you have any recommendations.